In an environment fraught with sensitivities, competition and consumerism, LG Electronics, hit upon a novel path to give consumers what they want. They put their finger on the pulse of the Indian consumer, heard what made their consumers’ hearts go pitter-patter and came back to the drawing board to roll out a slew of products that were customized to the Indian consumer. Consumer-centricity was the mother of the Indovation at LG and the products that evolved thereof were the hero products amongst the 200+ innovative products the company showcased in a show of strength at the LG TECH Show 2015. LG India had over 200 innovative products across categories that it wanted to showcase in its third edition of the Tech Show but it wanted to up the ante and do something different to get the conversations buzzing. The answer lay in the products that LG had specially created for India to address various issues faced by consumers here. Each of these was designed basis insights received from the Indian consumers and the outcome was products like the Mosquito Away Air Conditioner to deal with the mosquito menace and the illness that comes with it; the Smart Invertor 2.0 Refrigerator – a savior in the times of extended power outages in the country. LG reached out to us at Hill+Knowlton (H+K), their communication partner, and after much brainstorming we zeroed in on the theme of “Connecting Lives: Technologies for a better future”. We decided to leverage the Tech Show 2015 to highlight LG’s Indovation strategy by announcing the launch of four products, one in each of the four major categories that were the result of the India Insight program. LG and H+K decided on 360 degree communication outreach that included print, electronic, digital and social media. LG finalized 18th March, 2015 as the day when innovations for a better life would be unveiled in India. H+K invited all lifestyle and tech media/bloggers pan India to check out the new innovative offerings that put the consumer’s needs first. It was also an opportunity for LG to introduce them to the amazing futuristic line-up of all LG products under one roof. 200 products across categories vying for attention along with demo zones and deep-dive sessions that highlighted the expansiveness of LG’s technology leadership without being cramped needed a venue that could do the show full justice for which we got 20,000 sq feet at the Kempinski in Karkarduma on the edge of Delhi. To leverage the LG Tech Show as a one-of-its-kind property hosted only in India and to position LG as the innovation and technology leader we decided to go ahead with the launch of 4 flagship products across 4 categories of LG – the 105 5K TV, LG G Flex2, Inverter V Air Conditioner with Mosquito Away technology, and Smart Inverter 2.0 Refrigerator. Select media interactions were setup with Mr. Soon Kwon, M.D., LG India (now former) and other spokespersons across product categories to land the right messages aligned to LG’s India investment and sales strategy. To build the buzz, two days prior to the event, LG actively shared the some behind-the-scenes moments on social media allowing everyone a peek into what they could expect. Challenge No 1. Getting the relevant media to a venue almost 30 kms away from their place of work. Challenge No 2. Getting the journalists who had attended the Consumer Electronics Show in Las Vegas in January 2015 and the Mobile Word Congress in February 2015 therefore already seen the products, excited about the Tech Show. However, the pre-buzz on social media and the anticipation it built amongst worked in LG’s favour and the relevant media did get excited enough to want a close firsthand experience and the LG Tech Show 2015 saw over 200 media persons in attendance. Woven around the theme of ‘Connecting Lives: Technologies for a better future’, the Tech Show 2015 highlighted LG’s futuristic technology and innovative approach that won it market dominance in India. The flagship event worked as the perfect platform for the Indovation products. As an experience zone for top technology media, bloggers, reviewers and publications from across the country, invited to take a peek into the latest technological advancements and futuristic next-generation devices, it found great traction and served to reach out to a diverse range of audiences, through traditional and digital media as well as influencer groups. Firsthand feedback and fresh insights from experts in the field were an integral part of the Show. An interactive twitter contest on #InnovationForABetterLife packed with fun and techie interactions launched with the Show and an in-venue fun activity – the ‘Shout-out at LG Tech Show’ booth, where visitors shared some fun messages through a technology enabled sling-shot – won many fans. The media partners were thrilled to experience the technology extravaganza laid out in front of them. 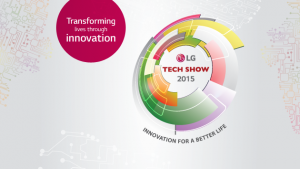 Positive messaging, exhaustive reviews and great tonality – the LG Tech Show 2015 had landed well with the media. H+K played its role well as it organized exclusive interactions with key spokespersons, armed every media person with enough content and data, ensured every media query was answered, and efficiently followed up to get those stories and LG’s India strategy messaging out there for the public at large. Thanks to the media outreach, 439 unique media impressions were garnered pan India across print, digital and broadcast. 130 media impressions specifically only talked about the launch of its four flagship products and display of its complete line-up of futuristic technology at the Tech Show apart from other product specific impressions. The social media conversations generated around 4 thousand mentions and 18 million impressions. As award-winning products and technologies for better future underscored LG’s commitment to the consumers, LG’s commitment to developing innovative solutions for the Indian consumers was much appreciated. The India Insight program, the foundation of the the Indovation products, landed well with media and the general public at large thereby helping achieve what we had set out to do. The Tech Show 2015 elicited appreciative feedback by the media about the concept, the product line-up and the opportunity extended to them, garnering positive stories for weeks that followed.